The 2.4-ton X-ray space observatory ROSAT is expected to break up as it plunges through Earth's atmosphere in late October, but some large pieces will likely make it through the intense heat of re-entry. According to German aerospace officials, approximately 1.6 tons of satellite debris, consisting primarily of up to 30 large glass and ceramic fragments, could survive the journey through the atmosphere and reach the Earth's surface. 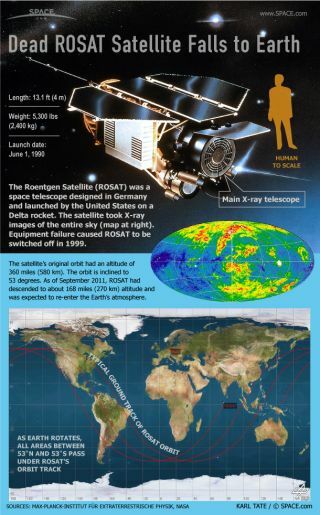 The SPACE.com infographic above offers some key facts about the satellite's ultimate demise.